When harvesting tasks finish, we have to begin baling and picking bale up jobs before harrowing our stubble. In our village, these tasks are performed by some farmers, who will sell bales to other farmers. In our case, the Rosado brothers have baled our stubble this year. They used their trucks to pick up our grain and we give them our straw. As they told us, they are baling about 25,000 bales per year, so they need to have the best machinery if they want to have done these jobs quickly, easily and cheap. While they were picking up bales, we could see how their Arcusin Auto Stack FS 72-81 trailer worked. We saw this job in the first time and it was impressive. It works completely automatically so it allows them to pick up, only with one person, a lot of bales in a sort time. This trailer is robotic to load and unload. You can see a video from here. After that, while they are building the bale overcrowding, they use a Merlo P 26.6 L-P telehandler to load their trucks. 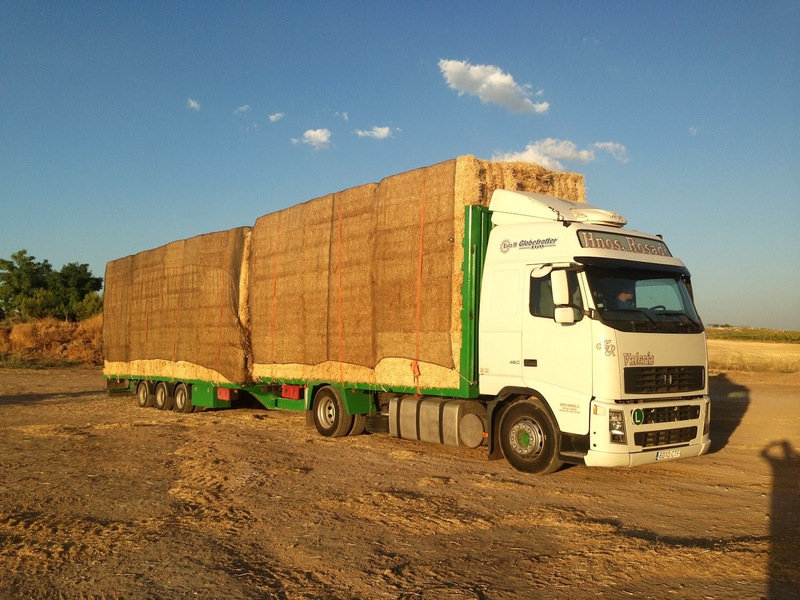 They distribute bales to farmers who buy them throughout the year, in Murcia area especially because they are from Bullas town. You can see other video about this job from here. We have fantastic views in La Mancha. Tenemos fantásticas vistas en La Mancha.